Was born in Dublin in 1837, and educated at Trinity College, Dublin. He is one of the most popular yachtsmen in Ireland, having devoted a great deal of his life to the sport. 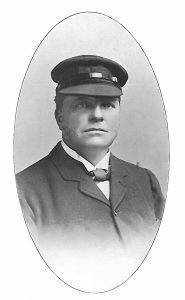 Commencing his career as a Corinthian in the Prince Alfred Yacht Club in 1856, he became a strong advocate of amateur racing, and during his subsequent racing career always steered his own vessels. He also aided in compiling the racing rules of the Club, which are embodied without serious alteration in the racing rules of to-day. He began as a racing owner in 1866, when he purchased the cutter Torch, 15 tons, built by Fife of Fairlie. With her he won £230 in two years, and she remained a most successful boat until the class was altered from 15 tons to 20 tons and under, when the Vampire and Lizzie, twenties, prac­tically extinguished her. He then owned the Torpid, Madcap, Hinda, and Finola, with which he won a fair share of prizes, the latter vessel contributing some £470 in 1880­ 1882. In 1885 he purchased the Olga, 5 tons, the champion of her class, and having won five first prizes out of six starts, her career was ended by being run down at anchor by a New Brighton ferry-boat on the Mersey, her owner and crew just managing to escape as she sank. The record of this boat was remarkable. He then built the Luath, 5 tons, designed by Paton, Olga‘s designer, to com­pete against the Doris, designed by Watson: in this she failed. In 1887 he built the Jess, 10-rater, from Watson’s design. She beat the Doris twice, but had too little sail for ordinary racing weather. 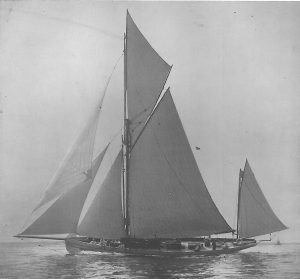 He built the Maya, 6-rater, in 1890, and Shulah, 6-rater, in 1891, both by A. E. Payne ; with the latter he generally won in fresh winds, but she was under-canvased for the summer weather of the Clyde and St. George’s Channel. Pleiad, Yawl, 49 tons. Mr. A. E. Watson. Besides figuring for half a century as one of the most consistent and successful owners in the St. George’s Channel, Mr. Thompson has been equally prominent in official and legislative work. He is one of the original members of the Y.R.A., and a keen worker for the benefit of the sport, having served continuously on the Council of the Y.R.A. from 1875 till 1904, when he resigned. As far back as 1869 he was made Rear-Commodore, and in 1871 he was elected Commodore of the Prince Alfred Yacht Club. On this Club becoming the Royal Alfred Yacht Club in 1872, he resigned in favour of the late Duke of Edin­burgh, and was elected Vice-Commodore. This latter appointment he held till 1876, when he resigned on going abroad. In 1896 he was made Vice-Commodore of the Royal St. George Yacht Club, an appointment held by him at the present time. During this period he has owned the Pleiad, 49-ton yawl, and now flies his flag on the Foxglove, 51-ton yawl. Clubs: Royal Alfred, Clyde, Corinthian, Dublin Bay Sailing Club, Lough Erne, Royal St. George, Royal Victoria, Royal London. Residence: 3, Fitzwilliam Place, Dublin.